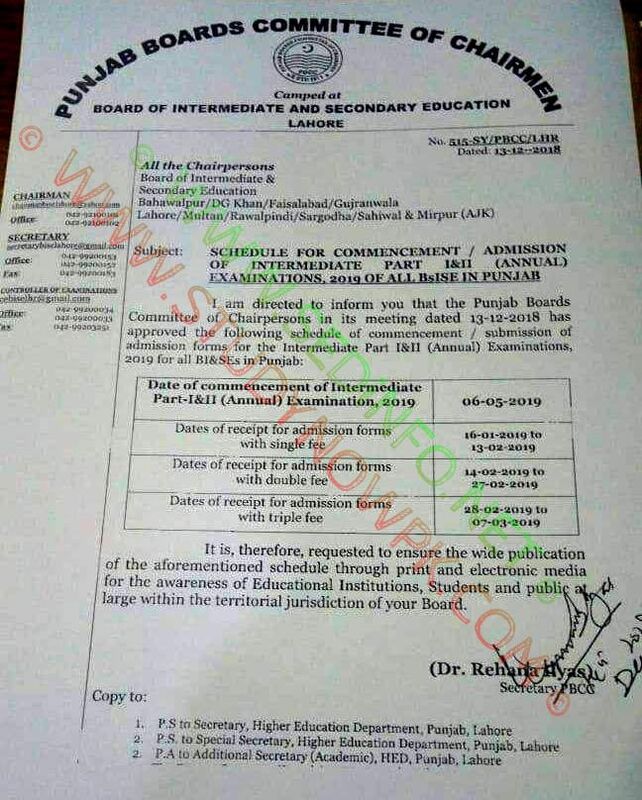 Here is latest update regarding all Punjab Boards Intermediate Part 1 and Part 2 Admission Schedule 2019. Punjab Boards Committee of Chairmen has announced admission schedule for Intermediate part 1 and part 2. Inter admissions 2019 includes admissions for many different study disciplines like FSc, FA and ICom etc. Those students who want to apply for inter part 1 or part 2 admissions, they can get complete information here. According to notification issued on 13-12-2108, Punjab Boards Committee Chairpersons in its meeting dated 13-12-2018 has approved the following schedule of commencement / submission of admission forms for the Intermediate Part 1 & Part 2 (Annual) Examinations, 2019 for all BISEs in Punjab. In order to submit admission for inter part 1 or part 2, you have to submit application form online. Open your respective boards website. If you don’t web address, click here. After opening respective board’s website, click on apply online and fill application form carefully. Submit filled application form and then print automatically generated fee voucher. Pay fee in bank, bank’s complete information is given on printed voucher. As you sending your admission form for appearing in final examination, 2019, therefore don’t miss our free of cost excellent study notes. We can not ignore the importance of past papers, as past papers give us better insight of upcoming exam papers.